Several of our past paricipants suggested that it would be great to have the retreat a little later in the year when we could do more outside. We thought that was a great idea! So this year we're holding the retreat from May 1-3, which means we'll have more daylight and more opportunities for outdoor activities like archery and challenge course. Sure, God's creation is just as magnificent in February, but we're all a little more inclined to spend more quality time with the created world when its warmer. In the last few years our program has filled up, and a few churches weren't able to participate. While our registration will still be limited, using the cabins means we have more overflow space and more flexibility when it comes to assigning sleeping areas. 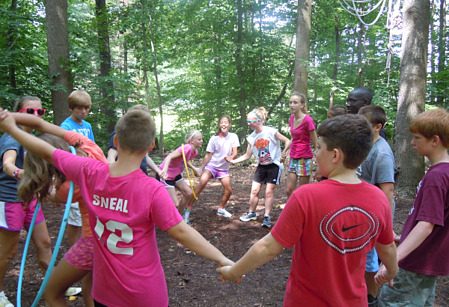 Cabin groups are one of the best parts of life at camp. Cabins hold around 12 people, which makes them a natural small group. These groups are big enough to feel like a community and small enough that no one is overlooked. 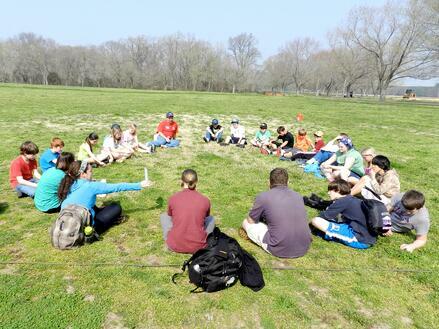 Your confirmation class will be divided up into single-gender cabin groups. Larger churches/classes may have multiple cabin groups, while smaller classes will be paired up to fill cabins. This does mean that your charge will need 2 chaperones per cabin. A Confirmation Retreat After Easter? I do realize that for groups who Confirm their students on Easter Sunday (April 5 this year), this date might not be a good fit. 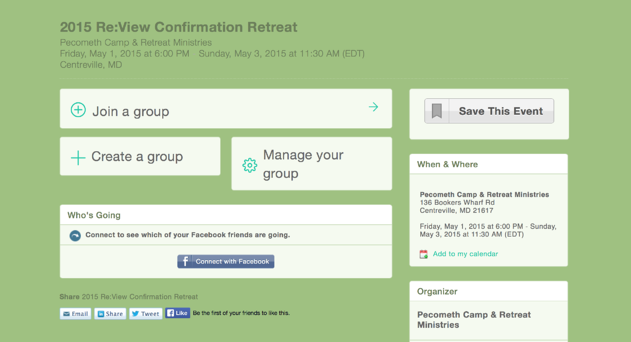 That being said, the retreat is designed to fit into any point in the Confirmation Process. ...but others have used it as a "kick-off" to the confirmation process. You could even use it as a post-Confirmation experience. After all, holding post-Confirmation confirmation activities is a great way to counter-act that persistent idea that Confirmation is a student's "Graduation" from Christian Education. If you're looking at this retreat as an opportunity for your students to prepare for their confirmation, I would suggest planning to confirm your students at Pentecost. But as I said, do what works for your group! Our registration site (Eventbrite) has added a new and improved "Group Registration" function, and we thought this retreat would be the perfect opportunity to test it out. Group Registration allows a group leader to manage their group and add or remove individual registrations. 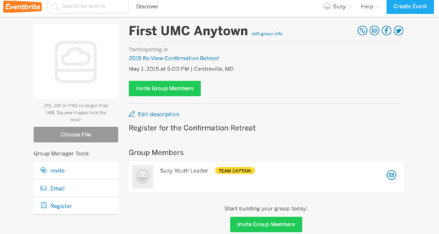 So for example, Susy Youth Leader of First UMC in Anytown can select the "Create a group" option in the screenshot below. She can register the students she knows are able to go. Later she can come back and select "Manage your group" to add more students or delete students who can't come anymore. Pretty cool, right? Another cool feature is that a special email registration page will automatically be created for First UMC Anytown. If Susy wants, instead of collecting registration info and money for all of her participants, she can send them the link to the First UMC registration website and have them each register and pay on their own. The group's registration page is even customizable, so that she can communicate information specific to her group (for example, what time you are meeting at the church to drive down to Pecometh). This option could be especially useful for confirmation classes made up of multiple churches or charges. One leader can create the group (For example: Greater Anytown Area Churches), and then each church can add their own registrations. It's up to you whether or not you want to use the registration page. As always, if you have questions about registration or the retreat itself, I'm happy to help. Just send me an email or give me a call (410-556-6900 x104). Providing a quality Confirmation experience is a big undertaking - but it's a critical part of building up the church! Let me know how I can help.